Just a day ahead of Apple's own iPad event that will see it introducing a range of new products including new iPads and a Retina iMac, Google has unveiled its next version of Android and three new Nexus devices, including the 5.9-inch Nexus 6 smartphone, the 8.9-inch Nexus 9 tablet, and the Nexus Player, an Apple TV-style set-top box that comes equipped with a gamepad (sold separately). Google's new Nexus 6 will be one of the biggest "phablets" on the market, and at 5.96-inches, it's even larger than Apple's recently introduced iPhone 6 Plus, which measures in at 5.5-inches. The phone features a 493 ppi AMOLED Quad HD display and a 13-megapixel rear camera with optical image stabilization, a feature Apple offers with its larger iPhone 6 Plus. It also includes a Quad-Core 2.7Ghz Snapdragon 805 processor, a 2-megapixel front facing camera, dual front facing speakers, and a 3220 mAh battery. The Nexus 6's battery can be recharged using Motorola's Turbo Charge technology, which provides up to six hours of battery life from a 15 minute charge. Available in midnight blue or cloud white for $649 unlocked, the phone comes equipped with 32 or 64GB of internal storage. 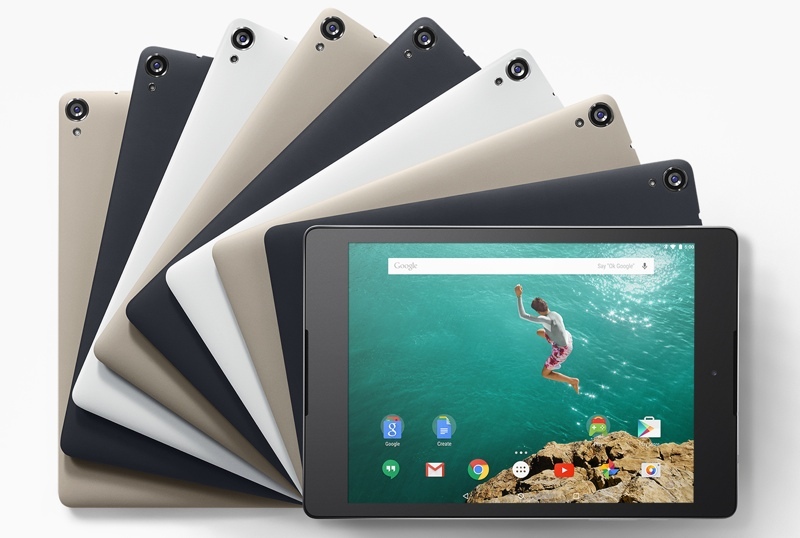 The Nexus 9 tablet, designed in collaboration with HTC, is Google's answer to the iPad Air and the Retina iPad mini. Coming in at 8.9-inches, it is sized between Apple's two tablets and features a thin bezel, brushed aluminum sides, and a nine hour battery life. Like Apple's iPhones, it comes in black, gold, and white, and it features a 64-bit NVIDIA Tegra K1 2.3Ghz processor. It comes equipped with front-facing HTC speakers, an 8-megapixel rear camera with a 1.6-megapixel front facing camera, and an optional magnetic keyboard. It has a 6700 mAh battery and front facing HTC speakers. Both the Nexus 6 smartphone and Nexus 9 tablet will ship with Android 5.0, aka Lollipop. Lollipop includes 5,000 new APIs and features "Material Design," to provide a consistent experience across a range of different devices. Lollipop lets users mute incoming calls and notifications with a new feature similar to Apple's built-in "Do Not Disturb" function, and there's a battery saver feature that can extend battery life by up to 90 minutes. Lollipop also supports multiple user accounts, a popular feature iOS users have hoped that Apple would implement. Along with the Nexus 6 and the Nexus 9, Google has unveiled a new set-top box, the Nexus Player, which is the first device that runs Android TV. Designed in collaboration with ASUS, the round hockey puck-style Nexus Player is designed to compete with the Apple TV, serving as a streaming media player for movies, music, and videos. It's also a gaming device, letting users play Android games on their TVs with a game controller, and it includes both Chromecast support and voice control. Apple too is said to be aiming to introduce an updated Apple TV with gaming capabilities and Siri integration, but it remains unclear when that device might debut. Google's Nexus 6 smartphone will be available for preorder beginning on October 29, while the Nexus 9 tablet and the Nexus Player will be available for preorder beginning on October 17. Android 5.0 Lollipop will be available on all three devices and on the Nexus 4, 5, 7, 10, and Google Play edition devices "in the coming weeks." Despite not being a true 'Mac' rumor, I'm grateful for the occasional tidbit on Apple's direct competitors. They influence my decisions, and almost certainly push Apple to make continually better products. Not interested anymore....... Got my 5.5" iPhone!! 6 hour battery life from a 15 minute charge? I'm a little jelly. I seriously don't understand why EVERY tablet does not come with front-facing speakers. Extra points to the tablets that do. It's so ridiculous to have to cup my hand under my (fill in the blank) tablet to get the sound coming toward me instead of the floor or table or other people. So why do competitors try to upstage Apple by releasing their wares a day before Apple? Upstaging Apple is impossible, and this ensures their announcement will be forgotten tomorrow. Why not wait until a month or more after the relevant Apple event once the hype has faded? Because these companies aren't run by very bright people. the nexus 6 runs iOS apps ? oh wait it doesn't.....thats why its not worth the price.